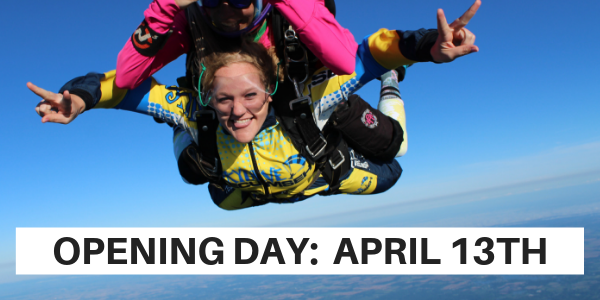 At Skydive Tecumseh, we take pride in providing each of our guests with a truly unforgettable skydiving experience. Our professional team of instructors and staff work hard each day to ensure that your skydiving adventure is memorable for all of the right reasons. We value our customers’ feedback and are honored when they take the time to leave a review and share their experience with us. If you’re thinking about jumping with us, we invite you to take a moment to read through a few of the Skydive Tecumseh reviews below. All of these reviews are legitimate! You can also head over to our Facebook Page to check out more skydiving reviews from our guests as well as Yelp, Tripadvisor and our Google Business Page. Went and did my first jump with Skydive Tecumseh and it was awesome! My dad had been telling me for 10 years he was going to take me and never did. So finally for his 50th birthday, I took him! It was an amazing experience all thanks to the staff at Skydive Tecumseh! They were friendly, helpful, and totally laid back! They definitely knew how to make a first-time jumper feel at ease! I would highly recommend them and will definitely be going back again! We had to reschedule our jump three times due to weather, but it was definitely worth the wait and I’m definitely going again! The entire crew was amazing! An experience you MUST try! Its been awhile since I have been skydiving, but I have been wanting to go back! From the moment I arrived, the staff made me feel safe and comfortable, and gave me all of the necessary information I would need to….jump out of an airplane! This was an experience I will never forget, and cannot wait to go back soon! My first skydive! What an amazing experience! Tecumseh skydive treated me great and answered any and all my questions! I ended up getting my skydive recorded, which I recommend. The video was edited quickly and copied on a dvd/cd for me to keep. It was great. Went from 18,000ft. It was on July 2, 2016. It was my 2ndtandemm flight. I will definitely come back. Recommend Skydive Tecumseh to everyone it was a great way to start your day. I’m 63 and coming back every year. Very professional and friendly staff. I absolutely LOVED it. I’ve been to Tecumseh skydive for a total of 3 times now, it’s always an amazing experience. The people there are so friendly and outgoing. Always a stellar time. Fast efficient staff, GREAT friendly tandem jumpers! This is the best place stateside to jump! You can bring all levels of family and friends and all will have a lifetime experience. A1 setup here. My favorite in Michigan by far. Most amazing experience! Thank you Kenny for being up beat and making this life changing experience even better!! Highly recommend!! Skydiving for the first time at Skydive Tecumseh was by far one of the greatest experiences of my life. No matter how high maintenance I was before the jump when I was scared, every single jumper employee did everything they could to make my experience unforgettable. I have already recommended here for many of my friends wanting to go with me for their first time on my next round! Great experience!! This was my third time doing a tandem jump but first time with Skydive Tecumseh. Being able to jump from 18,000 feet was awesome! Plane ride up is quick and comfortable. Instructors were friendly and professional. If you’re thinking about…just do it!! I drove more than 2 hours to jump with Tecumseh because I wanted a reputable company and I was not disappointed. They were very safety minded and professional. The staff was very friendly and made the whole experience fun! If you’re only doing it once, pay the extra and get the video package. Very well done, you won’t be disappointed. This place was AMAZING! The staff was very knowledgeable and helpful. I will definitely be back and suggest this place to all of my friends. No words can describe the feel of my first skydive. My instructor Josh, did a fantastic job! I appreciate how he handled me. Everyone who takes part at Tecumseh Skydive Team, are friendly, funny, and understanding.Over all, it was a fantastic day! I did it! Thank you for showing me to place my fears aside and enjoy the ride down! Loved it! I went skydiving for the first time this summer and it was hands down one of the coolest experiences of my life! Can’t even describe the feeling! All the staff made the experience even greater! Would go again in a heartbeat if I got the chance. Great experience from start to finish. I was a first time skydiver and as expected was a bit nervous. The person I jumped with kept things lighthearted and positive so that I actually felt more excited about the experience. It was unforgettable and cannot wait to go again! Wonderful staff — my tandem instructor, James, was funny, clear, and made sure that I was comfortable during the entire experience (which involved two flights and a bit of “will-we-or-won’t-we” due to clouds). The dive itself is unreal — exhilarating and meditative, terrifying and relaxing, absolutely breathtaking. I absolutely recommend you try it here first. Skydive Tecumseh has a great reputation, and there’s a reason for that. I hope to go again. Highly recommended to anyone looking to experience true human flight! I’ve gone twice and have plans on going again this summer! There are few words to describe the feeling one gets falling over 100 mph through open sky, taking in the world around you and experiencing pure bliss. The last time I jumped, we fell through a thin cloud and I could literally feel the cloud’s moisture wash against my face as we descended past it. It was unreal. Please go to Skydive Tecumseh, because they will definitely not let you down (no pun intended)! Not to mention, there’s great merchandise sold in their shoppe!